^ magnet. Encyclopædia Britannica. 2013. ^ Fowler, Michael. Historical Beginnings of Theories of Electricity and Magnetism. 1997 [2008-04-02]. ^ Vowles, Hugh P. Early Evolution of Power Engineering. Isis. 1932, 17 (2): 412–420 [419–20]. doi:10.1086/346662. ^ Li Shu-hua. Origine de la Boussole II. Aimant et Boussole. Isis. 1954, 45 (2): 175. JSTOR 227361. ^ Pliny the Elder, The Natural History, BOOK XXXIV. THE NATURAL HISTORY OF METALS., CHAP. 42.—THE METAL CALLED LIVE IRON. Perseus.tufts.edu. Retrieved on 2011-05-17. ^ Schmidl, Petra G. Two Early Arabic Sources On The Magnetic Compass (PDF). Journal of Arabic and Islamic Studies. 1996–1997, 1: 81–132. ^ Griffiths, David J. Introduction to Electrodynamics 3rd. Prentice Hall. 1999: 255–8. ISBN 0-13-805326-X. OCLC 40251748. ^ B. D. Cullity, C. D. Graham. Introduction to Magnetic Materials 2. Wiley-IEEE Press. 2008: 103. ISBN 0-471-47741-9. ^ Boyer, Timothy H. The Force on a Magnetic Dipole. American Journal of Physics. 1988, 56 (8): 688–692. Bibcode:1988AmJPh..56..688B. doi:10.1119/1.15501. ^ Units for Magnetic Properties (PDF). Lake Shore Cryotronics, Inc. [2012-11-05]. （原始内容 (PDF)存档于2011-07-14）. ^ Zachariah Allen. Philosophy of the Mechanics of Nature, and the Source and Modes of Action of Natural Motive-Power. D. Appleton and Company. 1852: 252. ^ Wayne M. Saslow. Electricity, Magnetism, and Light 3rd. Academic Press. 2002: 426. ISBN 978-0-12-619455-5. ^ Mice levitated in NASA lab. Livescience.com (2009-09-09). Retrieved on 2011-10-08. ^ Standard Specifications for Permanent Magnet Materials (PDF). MMPA 0100-00. ^ 電子能量公司網頁： 存档副本. [2016-08-31]. （原始内容存档于2009-08-11）. ^ The 2012(28th)Japan Prize. Laureats of the Japan Prize. The Japan Prize Foundation. [2012-03-15]. ^ Drak, M.; Dobrzanski, L.A. Corrosion of Nd-Fe-B permanent magnets (PDF). Journal of Achievements in Materials and Manufacturing Engineering. 2007, 20 (1–2). （原始内容 (PDF)存档于2012-04-02）. ^ Ruskell, Todd; Tipler, Paul A.; Mosca, Gene. Physics for Scientists and Engineers 6. [Macmillan. 2007. ISBN 1-4292-0410-9. ^ Schenck JF. 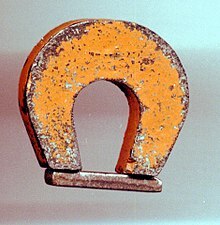 Safety of strong, static magnetic fields. J Magn Reson Imaging. 2000, 12 (1): 2–19. PMID 10931560. doi:10.1002/1522-2586(200007)12:1<2::AID-JMRI2>3.0.CO;2-V.
^ Oestreich AE. Worldwide survey of damage from swallowing multiple magnets. Pediatr Radiol. 2008, 39 (2): 142. PMID 19020871. doi:10.1007/s00247-008-1059-7.